We always love feedback from our clients and are pleased to share our stellar reputation with you. Amazing! Dr. Buck goes above and beyond expectations. He shows pictures, interacts and really explains the anatomy of your specific eye. The staff is helpful, cheerful and make you feel important and well taken care of. Fun times to be had! We were so thankful to receive thorough eye exams from Dr. Buck, and great customer service from his team! The technicians were friendly, patient and helpful. My sons really had fun choosing their first pair of glasses. No rushing us along or pressure to buy more expensive brands. They really wanted our boys to have what fit best and made them feel confident in their new specs. The newly opened office is clean, comfortable and inviting. What a gem to find this eye center so close to town. 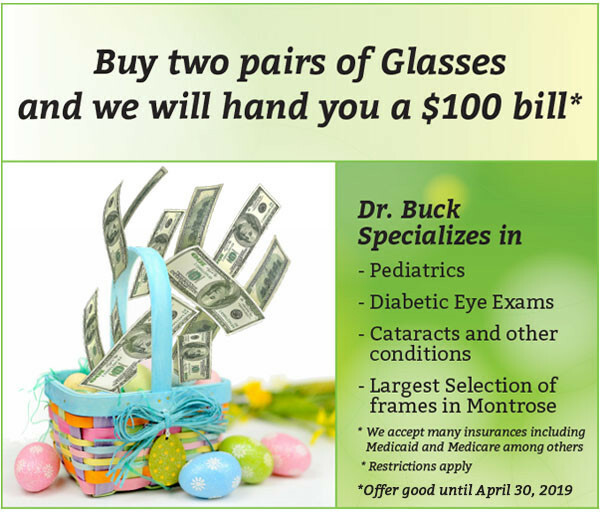 We won’t be going to GJ for any of our optical needs now that we have an office with super staff and a great selection of eyewear right here in Montrose. Professional and knowledgeable. Quality service and good customer service! Not pushy selling frames etc…enjoyed my visit and will bring my kids in next. We took in the family to see Dr Buck. He clearly had experience with our children and eased the anxiety for my daughter to start wearing glasses again. The environment was friendly and took care of all our needs. We were happy with the selection and all 3 of us walked out with new glasses. 1 Hour EyeDocs took care of it all.